"House Eureka Chantilly Gouvieux" with terrace and garden with trees 6/8 p.
Our "Maison Eureka Chantilly Gouvieux" is a family holiday home. It has 3 beautiful bedrooms, one of 25m ², 2 bathrooms and can accommodate up to 8 people. 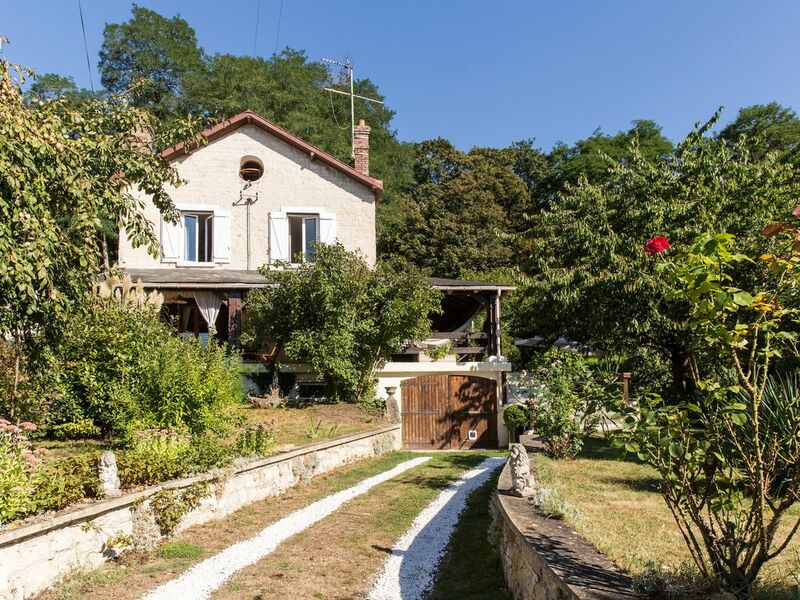 In stone, on 3 levels and dating from 1880, entirely renovated it is endowed with an exceptional shaded terrace of 50m ² overlooking the garden in edge of forest. Barbecue, water basins, hammock and fireplace, 5 minutes from Chantilly and less than an hour from Paris. Disneyland Paris, Parc Asterix and the Sable Sea are less than 1 hour away. Depending on the number of people and bedding required, the number of rooms available may vary. In any case the house is privatized for you. 2nd level: 1 bedroom 25m² with queensize bed 180x200 + extra mattress beyond 6 pers. Supplement 30 euros if bed is desired for 6 people or less. Great lovers of gastronomy, our kitchen has all the necessary utensils to prepare delicious meals! The basement is not included in the rental and remains at the disposal of the owners in case of need. Access is independent of the upper levels of the house and will in no way undermine the tranquility or privacy of the tenants. This is a lovely, older home in a quiet neighborhood. The bedrooms on the 2nd floor are spacious. The bathroom on the 2nd floor is small, with a tub and hand held shower. The toilet is in a very small room. The bathroom with the walk-in shower is on the first floor. The kitchen is large, but the stove/oven is slow to heat, so preparing meals took longer than necessary. Charlotte e-mailed a 16-page instruction booklet, which was helpful. The washer is a small, under the counter type, with no dryer. The weather was cold and wet, so drying our clothes wasn't easy. Supermarkets are nearby. Ma réponse au commentaire Small : Thank you Barbara for your 5* comment ! We are very happy you enjoyed your stay. There is now a second toilet in a big room. And we bought a 7kg cleaner.